Produced in high clarity clear injection moulded plastic. Outdoor holders are hand fabricated from acrylic with holes for wall mounting and a self closing lid. Overall: Width 102mm Height 53mm Depth 38mm. Internal Width 93mm Depth 17mm. Overall: Width 63mm Height 71mm Depth 37mm. Internal Width 56mm Depth 18mm. Overall: Width 100mm Height 90mm Depth 100mm. Overall: Width 197mm Height: 93mm Depth 112mm. Internal Width 95mm Depth 18mm. Overall: Width 422mm Height: 305mm. Each pocket internal Width 95mm Depth 24mm. Overall: Width 101mm Height 37mm Depth 23mm. Internal Width 93mm Depth 18mm. Overall: Width 110mm Height 65mm Depth 90mm. Internal Width 100mm Depth 45mm. Overall: Width 210mm Height 340mm. Each pocket internal Width 93mm Depth 18mm. Overall: Width 297mm Height 465mm. Overall: Width 420mm Height 345mm. 24 bay wall holder with 6 stand-offs. Overall: Width 340mm Height 889mm. 30 bay wall holder with 6 stand-offs. For printing orders, artwork ready files need to be received prior to cut off time. The following locations may be subject to a postal surcharge, dependent on parcel size and weight. AB31 - AB38, AB40 AB56, IV1 IV28, IV30 IV32, IV36, IV40, IV52 IV54, IV63, KW1 KW14, PA21 PA38, PH4 PH41, PH49 PH50, BT N.
HS, IV41 49, IV51, IV55 IV56, KA27 KA28, KW15 KW17, PA20, PA41 PA49, PA60 PA78, PH42- PH44, ZE, IM (Isle Of Man), Channel Islands. Return posting costs will be at your expense. Please note personalised products are non-refundable unless there is a manufacturing defect. -- Produced in high clarity clear injection moulded plastic --- Rounded corners for safety --- Outdoor holders are hand fabricated from acrylic with holes for wall mounting and a self closing lid Landscape holder Overall: Width 102mm Height 53mm Depth 38mm Internal Width 93mm Depth 17mm Portrait holder Overall: Width 63mm Height 71mm Depth 37mm Internal Width 56mm Depth 18mm 4 bay holder Overall: Width 100mm Height 90mm Depth 100mm Internal Width 93mm Depth 17mm 8 bay holder Overall: Width 197mm Height: 93mm Depth 112mm Internal Width 95mm Depth 18mm 16 bay counter holder Overall: Width 422mm Height: 305mm Each pocket internal Width 95mm Depth 24mm Wall mount holder Overall: Width 101mm Height 37mm Depth 23mm Internal Width 93mm Depth 18mm Outdoor holder Overall: Width 110mm Height 65mm Depth 90mm Internal Width 100mm Depth 45mm 8 bay wall holder Overall: Width 210mm Height 340mm Each pocket internal Width 93mm Depth 18mm 12 bay wall holder Overall: Width 297mm Height 465mm Each pocket internal Width 93mm Depth 18mm 16 bay wall holder Overall: Width 420mm Height 345mm Each pocket internal Width 93mm Depth 18mm 24 bay wall holder with 6 stand-offs Overall: Width 340mm Height 889mm Each pocket internal Width 93mm Depth 18mm 30 bay wall holder with 6 stand-offs Overall: Width 340mm Height 889mm Each pocket internal Width 93mm Depth 18mm. 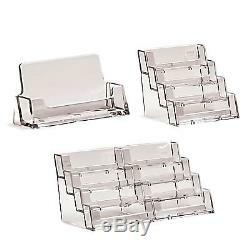 The item "Business Card Holders Acrylic Display Stand Retail Counter & Wall Dispensers" is in sale since Friday, October 18, 2013. This item is in the category "Business, Office & Industrial\Office Equipment & Supplies\Office Supplies & Stationery\Business Cards". The seller is "displaypro_uk" and is located in Gt Yarmouth. This item can be shipped to all countries in Europe.